Remember the days when exercise clothes belonged only in the gym? Today, athletic wear can take you from the mat to the mall with just a few thought-out touches. When putting together a daytime errand-running-lunch-with-friends snazzy yet uber comfy ensemble, think trendy and practical at the same time. Fit leggings and a strappy sports bra are perfect for layering with an open back tank or a pullover that is equal parts cozy and chic. The sweater pictured here with a high low hem and side slits looks adorable with a knit scarf that ups the cozy factor. Finally, some rose gold flats with coordinating hardware on a handbag add just enough accessorizing to create a smart and fun street look. A few simple additions can take your workout wear into town. 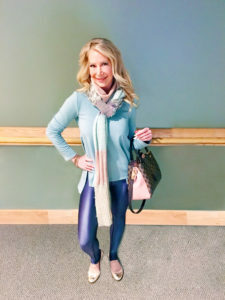 Sometimes our afternoon errands and late day workout routine take us into sunset creating the need to dress appropriately for happy hour, catching an early bird dinner, or dashing off to watch our childâ€™s practice or rehearsal. In those unforeseen, yet probable, cases, I recommend a chic jacket with lots of detail to pair with solid colored yoga gear. A cropped style works just as well as a hip length coat. If this outfit will be taking you into the night, dress the whole ensemble up with a clutch purse in a metallic hue or any other color coordinating with your footwear. Finally, gold hoop earrings are more than enough jewelry, especially with a detailed jacket. 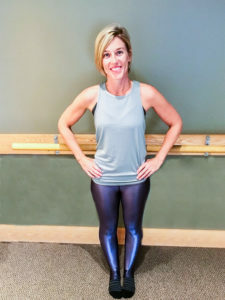 Once you start looking at your workout gear as additional pieces to your wardrobe, I bet you will quickly find many options that you hadnâ€™t previously considered. Donâ€™t be afraid to pair unlikely combos, such as kitten heel closed toe pumps with a textured pair of leggings, or a wedge sandal with flower print capris. Itâ€™s easiest to start blending your studio-to-street wear by pairing with neutral colors, flowy knits and chunky jewelry to create a cool, put together vibe. Most important is that you feel good in your own skin, express yourself freely and strive to live from an attitude of gratitude.